Bass | Beer Apprentice - Craft Beer News, Reviews, Interviews and Info. For today’s craft beer review I’m going to be trying a beer that I haven’t had in a very long time. 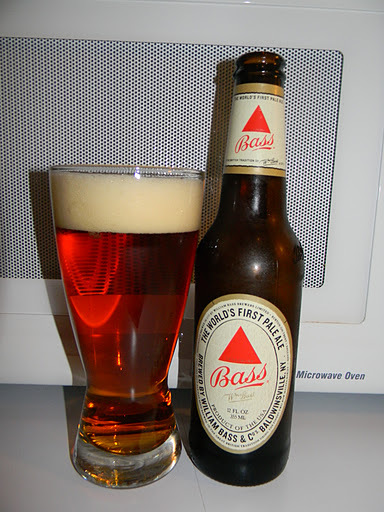 A Bass Pale Ale produced by Bass Brewers Limited located in Burton-on-Trent Staffordshire, United Kingdom. Now, the way I understand it, AB InBev has invigorated the Bass brand in the U.S and started brewing it at the Baldwinsville Brewery in New York in June of 2011. So be it, let’s just find some information about this beer from the website, bassale.com. Available filtered in bottles, cans, and kegs. A version of Bass for the North American market at 5% to comply with USA ale regulations. Brewed from the late 70’s at Burton. In 2000, after Interbrew bought the Bass brand, production was switched to the Ulster brewery in Northern Ireland. In 2003 production and distribution was switched to Latrobe for a 12-18 period. Now being made back in the UK once again by InBev. After reading that, I have no idea where the beer is made. Heck with it, let’s just drink it. This beer was poured from a 12 oz. bottle with an ABV of 5.0%. The brewed poured a very clear, amber to copper/orange color with some burnt orange highlights at the bottom and around the edges of the glass. The head was off white, of good size, kind of fizzy and a bit soapy in texture. The retention time left a little to be desired and the lacing was slight. The nose on the Bass Pale Ale was of some sweet caramel and toffee malt intermingled with some toasted grain and wheat bread characteristics. It was also rather “earthy” and “herbal” with a very relaxed hop profile. An inclination of dried leaves hid in the background. Overall, it seemed a touch stale, uncomplicated and mostly straight forward. The taste brought forth more of the caramel and toffee malt. Additions of the “earthy”, toasted grains and wheat bread characteristics as well as a delicate fruity characteristic gave a little complexity. Some savors of buttered biscuits also played a supporting role. The bitterness was moderate, however everything seemed to be balanced well enough, although subdued and tenuous. The mouthfeel was medium to medium/thin. Dry, crisp, refreshing and thirst quenching. A scant amount of flavor was left behind on the palate, but truth be told, it was quite a bit more than I was expecting. Well, this beer is not horrible. It’s much better than I remember it being that’s for sure. In a lot of ways it reminded me of the Oktoberfest/Marzen beers more so than a Pale Ale. I guess the “toastiness” and the “earthiness” lends a hand in that respect. I think this beer could be a great beer to have around the BBQ or to have during the crisp Fall days. I also think it would show well as an introductory craft beer. It has some flavor and is relatively easy to drink, so that’s not all bad. Otherwise, it’s mostly just an average beer for me. Sure, I would drink it again if it were offered, however I don’t think that I will be going out of my way to grab a 6-pack of this anytime soon. What beer would you guys recommend to a non-craft beer drinker to get them started down the “better beer” path? Thanks for reading and commenting folks. It’s greatly appreciated.